A legal commitment is the act whereby a public structure establishes an obligation which will result in an expense. All the contractual acts corresponding to this definition are subject to a legal commitment whatever their nature: purchase order, instalment contract, lease, etc. The Commitments area of Chorus Pro allows an invoicing structure to consult its commitments as issued by the State. 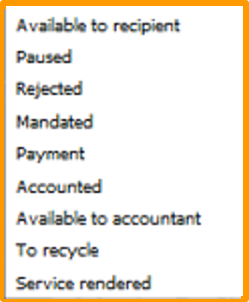 In Chorus Pro, using this reference is mandatory in order to submit invoices to the attention of the State. It allows to establish a link to established between the invoice and the purchase order. All invoice issuers to the State can connect to Chorus Pro and use the Commitments area. The Commitments area allows you to view all validated legal commitments in the State's financial information system regardless of their nature (lease, instalment contract, purchase order, etc.). To be viewed in Chorus Pro, the commitments must be in the « ordered » status in the State’s financial information system and the commitment must be firm (eg : exclusion of unconfirmed conditional tranches). A new commitment created into the State’s financial application appears at D+1 in the « Commitments » area of Chorus Pro. Please note : Commitments issued by non-State public structures cannot be viewed in the Commitments area (local authorities, healthcare establishments, operators,..). One of the issued or submitted invoices must have the status « payment ». Connected users of your structure to this area. Please note : if the link to the Commitments area is not visible, check the settings of your account and your structure referring to the prerequisites. Once you have clicked on the “Commitments” area, the screens that displays by default is that of the « Synthesis » tab which list all the active commitments. If you have rights on several issuing structures, you can filter on a specific structure by selecting it from the « Structure filter » drop-down menu and then clicking on the « Apply » button. 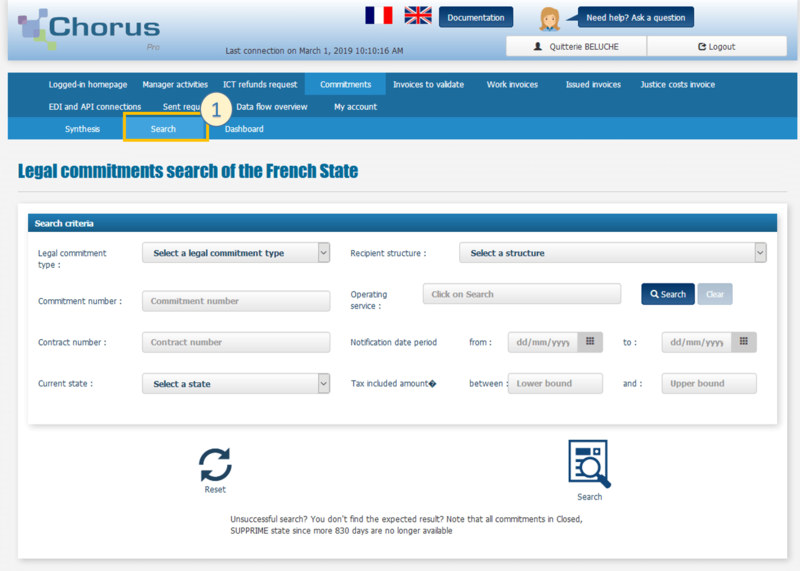 Click on the « Search » tab to access the legal commitments search page. 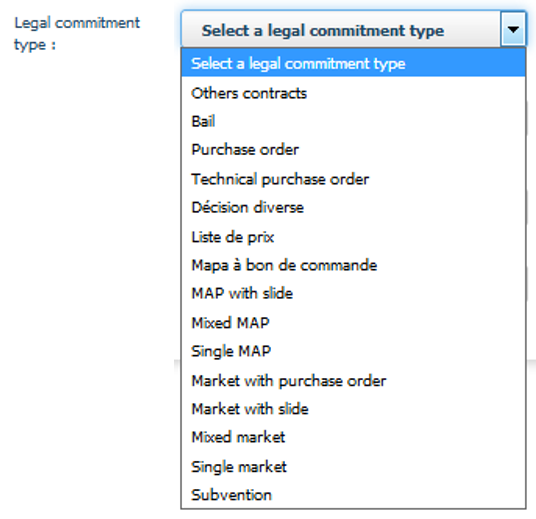 This screen allows you to search for a legal commitment according to several criteria. 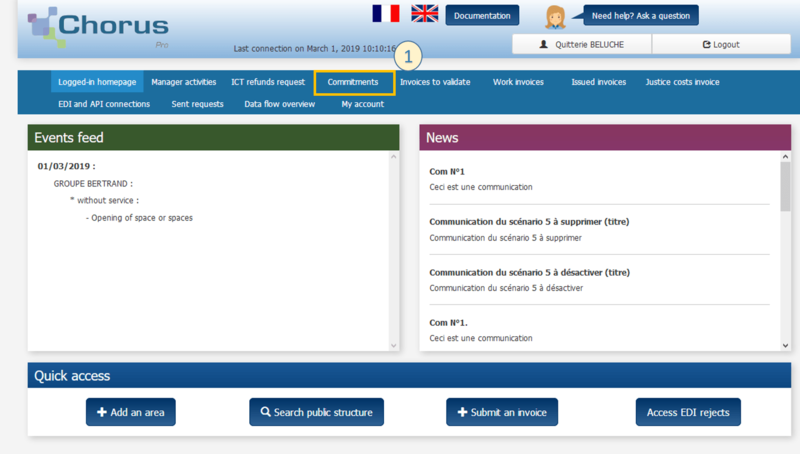 Enter one of the available search criteria and click on the « Search » button. The reset button clears all the search criteria entered. All commitments types are available in the drop-down menu of the search page. Commitments such as Leases, Miscellaneous decisions and Subsidies are available to partners who have contracted this type of commitments with a government service. For subsidies, only multi-year operation subsidies are available. There is no history recovery, only Leases, Miscellaneous decisions and Subsidies ordered after 11/11/2017 will be available. If an invoice needs to an unavailable lease, miscellaneous decision or subsidy, a request must be created for its manual processing. Issuing structure : This relates to the structure receiving the legal commitment, that is to say, as a general rule, the contractor as specified in the commitment. Commitment number : It is the number identifying a legal commitment. As far as the State is concerned, it is composed of 10 digits. A commitment whose status is either « Ordered » or « Chorus Pro invoiced » can be referenced on invoices to the State. The search results are displayed at the bottom of the page. You can download one or more legal commitments by selecting the lines using the checkbox (1) and then clicking on the « Download attachment(s) » button (2). Search results can be sorted by clicking on the « Sort Arrows » (3) to the right of each field. The details of a commitment can be accessed by clicking on its « Number » (4). The Consultation screen allows you to view the details of the selected legal commitment. Two downloading functionalities are available at the bottom of the screen. This function allows you to download the Commitment details as displayed on the screen. Clicking on this icon allows you to access the processing history of the legal commitment. The « Export » function allows you to export the data in a CSV-type file. Click on « Dashboard » to access the overview of legal commitments. 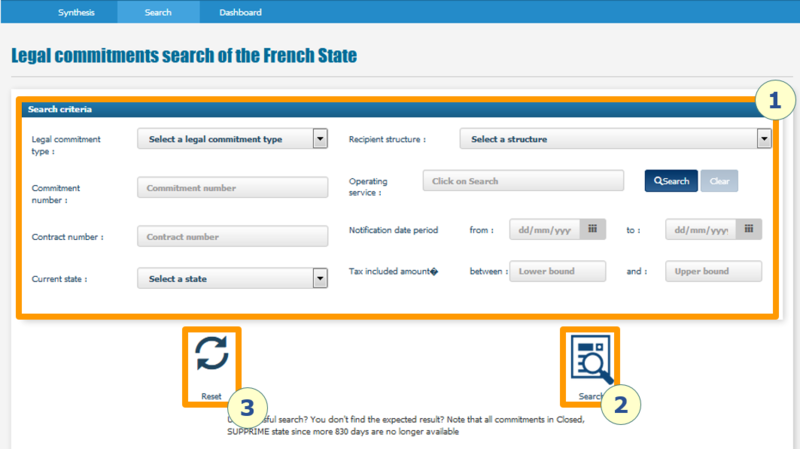 For each recipient structure, the dashboard displays the number of legal commitments "Ordered", "Chorus Pro invoiced" or "Closed". Clicking on a number of legal commitments gives you a detailed list of commitments. 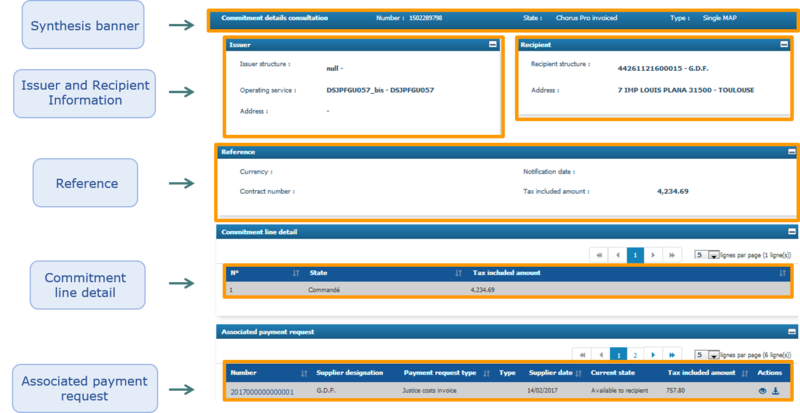 At the bottom of the screen, the « Input a payment request » button allows you to input an invoice with reference to the legal commitment displayed. Clicking on the « input a payment request » gives access to the functionality of input and not the submission. There is no shortcut to submit a payment request from the Commitments area. Click on « Continue » to validate your selection. Depending on the choice made, the user is then directed to the « Input invoice » screen or to the « Input a justice costs invoice » screen. The features of the two screens are then identical to those of a direct input on the Chorus Pro portal. Refer to the user guides « Input an invoice » and « Input and manage justice costs invoice” to complete the entry and validate the payment request. By having this link to commitments, the supplier data and the commitment number are populated when entering your payment request. Following the input, the payment request can be viewed on the legal commitment consultation screen, in the « Associated payment request » section. The icons allows you to view and download the payment request linked to the the legal commitment. The status of the payment request will be identical to those of an invoice directly entered in the Chorus Pro portal.